As an innovator and early adopter of freeways, California became the symbolic capital of car culture. But the ease of movement conferred by the massive postwar freeway building boom was short-lived, turning the dream of car travel into a nightmare of congestion and long commutes. The story of how Californians went from getting around to getting stuck behind the wheel is deeply entwined with the history of the urban freeway, an enterprise that advanced earlier and on a larger scale here than anywhere else in the country. Half a century ago, there was reason for optimism about cars. Los Angeles native Michael Alexander remembers the days when the old saying about getting anywhere in Los Angeles in 20 minutes actually held true. I trusted it at least in the first decade of driving that I did, he said. In 1964, Alexander was a newly minted teenage driver, many freeways had just been built and he got a job as a clown in the L.A. City Traveling Circus, performing at city parks from the San Fernando Valley to the port cities. We were truly able to ride the speed limit at any time of the day, he said. Today, that 20-minute rule is absurd. His wife, Vicki Kirsch, budgets five to six times that long to drive from their home northeast of downtown to her job teaching music at UCLA about 15 miles away. Traffic data analytics firm Inrix ranked L.A. traffic not just the worst in the country, but the worst in the world in 2017, citing drivers spent more than 100 hours a year delayed by congestion. It was not much better in the San Francisco Bay Area, ranked fifth most congested worldwide, where drivers were stuck in traffic almost 80 hours, according to Inrix. The limited-access highways in urban areas were conceived in the 1920s as a way to provide speedier thoroughfares for cars while excluding streetcars, pedestrians and intersections. That history can be traced less than a mile from Alexander and Kirschs home on a drive they take nearly every day down the Arroyo Seco Parkway, one of the earliest freeways in the country. In the decades that followed, California did connect them -- financing and designing a massive network of freeways that spans more than 50,000 miles across the state, a system that would become a model for the rest of the country. California was the right place, but it was also the right time, said Brian Taylor, an urban planning professor who directs UCLAs Institute of Transportation Studies. The rise of the automobile was happening everywhere, but California was uniquely poised to embrace it, said Taylor, because it coincided with the states period of maximum growth. In the two decades after World War II, there was booming industry, plenty of land to develop and the population doubled. Car ownership was growing even faster than the population, with car registrations increasing by 10 percent a year between 1946 and 1958, according to the state Department of Motor Vehicles. In 1947, the state began raising the gas tax to fund the freeways with the landmark Collier-Burns Act, setting up a gas tax highway trust fund which would be copied at the federal level a decade later. Previously, most roads had been funded on an ad-hoc basis through bonds, tolls or local property taxes. The State Division of Highways, the precursor to Caltrans, built about a hundred miles of new freeway a year between the mid-50s and mid-60s, including sections of HIghway 101 in Northern and Southern California, and much of Interstate 5, along with interstates 405 and 280. Taylor said these roadways were designed for high speed and high capacity by an agency that had previously been responsible only for rural highways. We were off to the races building these big super highways that had really been designed to move people at 70 mph between cities rather than 15 mph within cities he said. What started as a hodge-podge of more modest facilities like Arroyo Seco Parkway, initiated and built at the local level and designed to fit the crowded urban environment, turned into a state-orchestrated effort that transformed urban landscapes with high capacity speedways cutting through the heart of cities and out to their fringes. Yet only about half the freeways that were planned for the state were ever built. By the 1970s cities were revolting against displacement and smog. Taylors research shows that state spending on freeways continued to increase, even as the number of miles constructed plummeted because of cost inflation. Almost as quickly as it began, the era of freeway building came to an end. But Taylor said its legacy can still be felt, and has only compounded as California cities have grown and densified. These facilities supported development very far from the city center and created an expectation that it was somehow normal and reasonable to travel very far, he said. The success of the freeways helped drive commerce, development and population growth across the state. The states population nearly tripled in the last half of the 20th century and the once-sparsley populated suburbs began merging with the big city centers. But Taylor said its a mistake to view the resulting vehicle traffic as a sign of failure or dysfunction. Congestion, not free movement is the natural state of thriving cities. So what Michael Alexander experienced in 1964 -- the dream of driving across a city in 20 minutes -- was an anomaly, a blip brought on by a sudden burst of new capacity. Its likely the dream of a 20-minute car commute will live on only in the memories of folks like Alexander. There are some interesting historical pictures in the original article. However the envio-Agenda 21 propagandists misplace blaming Freeways or cars for horrendous traffic congestion. 1. The population of CA has doubled from 20 million in 1978, to 40 Million, so naturally highways that worked well 40 years ago are obsolete and impossible to double capacity. 2. California has three million illegal aliens that should not be there. 3. Real estate development has grown at an insane rate. In 1964, Alexander was a newly minted teenage driver, many freeways had just been built and he got a job as a clown in the L.A. City Traveling Circus, performing at city parks from the San Fernando Valley to the port cities. We were truly able to ride the speed limit at any time of the day, he said. Wow, I got to CA in '73 and worked extensively in LA '73 to '76. I remember living in Westwood near Pasadena and taking a girl out in Laguna Beach, about 60 miles away. I was headed home one Saturday night and traffic was crawling about 15 mph at 2 AM! I find it hard to believe that he could "ride the speed limit at any time of the day." LA freeways were always clogged from the 50s. My wife and I went 90 miles from the San Fran Peninsula to near Modesto last Saturday. Horrible traffic everywhere! People can always have a 20 min. commute (or less).... they just have to live very very close to their workplace. The Beverly Hills Freeway, which would have connected the Hollywood and San Diego Freeways along Santa Monica Blvd. A local Democratic politician, Anthony Beilenson was instrumental in blocking this project. The Whitnall Freeway would have run down the center of the San Fernando Valley. The right-of-way had been acquired, and all that was left was to pour the concrete--but Caltrans walked away from it. The Pacific Coast Freeway would have run down the coast from Santa Monica into Orange County. The Slauson Freeway would have run along Slauson Ave. through South-Central LA and across the East Side into Orange County. There were also plans to build a freeway along Highway 39 from Huntington beach to Azusa and to connect the Foothill Freeway with the San Bernardino Freeway. This connection was partly completed, but as you proceed south, the freeway peters out into a residential neighborhood in West Pasadena. The fall-off in freeway construction seems to have paralleled the state's shift to the Left. California's car culture didn't kill the 20 minute commute, it was the booming economy, population explosion, cheap homes built on cheap land in bedroom communities and oh yeah, Jerry FREAKING MOONBEAM GAIA WORSHIPING Brown killing highway and freeway construction during his first mismanagement as governor that set the state back decades! But hey I guess I just remember things different. Far, far more than 3 million migrants, whole cities have few Caucasians in them now. I would guess 60 percent non Americans in East LA. In Realto, around 95%. I worked there a week and saw one other Caucasian. It has more to do with things like HOV lanes, uneducated drivers from all over the world and electronic truck driver logging. HOV lanes cause people to cross three lanes of traffic to get in and out. So they cut in front of six other cars. Uneducated drivers get in the left lane and stay there. Truck driver logging makes truck drivers travel in rush hour instead of at night like they used to. And ethanol fuels make cars break down. And don’t forget about all the people commuting to mass transit. She’s real fine, my 409. -Only the elite get to drive around in cars. Everybody else has to walk, ride buses, or ride bicycles. The Progs dream about this stuff - fewer people, fewer cars, Big Government in charge. California, home of the TARDS-IS. You forgot High Speed Rail Roads to no-where. Hey look! 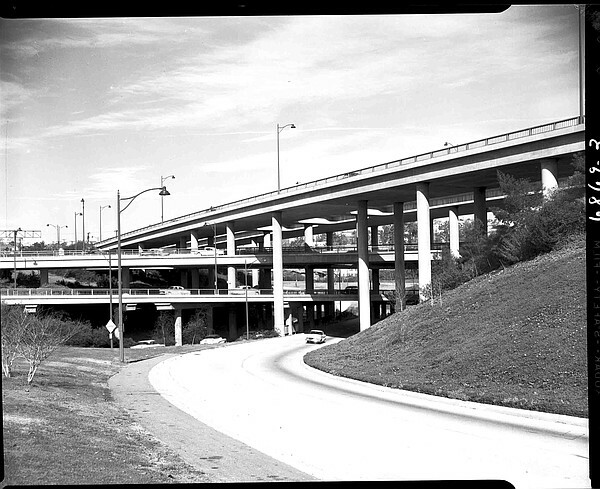 No homeless encampments or drug dealing under these freeways in 1956!